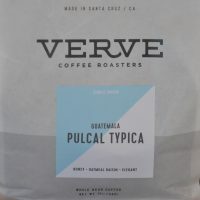 Verve Coffee Roasters started life in Santa Cruz, California, before spreading north to San Francisco, south to Los Angeles and then across the Pacific to Japan, with two branches in Tokyo and another in Kamakura. I first came across Verve as a roaster in Café Plume (now Paquebot Mont-Royal) in Montréal, before visiting Verve’s flagship branch on Pacific Avenue in Santa Cruz. The original Tokyo branch is in Shinjuku, a loud, busy place which I briefly visited in July. The second branch, subject of today’s Coffee Spot, opened in April this year. A much more relaxed basement affair under the Rag & Bone Store in Omotesando, I visited twice, first in July, and again on my return in October. Although a basement, it’s a fairly bright spot. There’s space for a counter down one side, with seating opposite, plus a small seating area at the back. 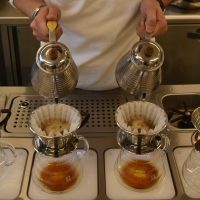 There’s the usual Verve offering, with a blend and daily single-origin on espresso, plus multiple single-origins on pour-over through the Kalita Wave. All the coffee, which is roasted in Santa Cruz and air-freighted over, is available to buy in retail bags. Meanwhile, if you’re hungry, there’s a selection of waffles, all made to order. I visited Verve’s flagship store on Pacific Avenue in Santa Cruz at the start of last year, part of my road trip from Phoenix to San Francisco via Los Angeles and the Pacific coast. Santa Cruz, home of Verve Coffee Roasters, which still roasts in the town, was my final stop before the trip ended at San Francisco later that day and, to not visit at least one Verve branch would, have been very remiss of me. Back then Verve had four branches in Santa Cruz, three in Los Angeles and one in Tokyo. Since then it’s opened its first San Francisco store (which I missed by a few weeks) and two more in Japan, where I’m headed in two days’ time. Hence my desire to get this published before I go. The Pacific Avenue branch is lovely, a large, open, high-ceilinged space with twin Kees van der Westen Spirit espresso machines, serving a house-blend, guest and decaf, while three Modbar pour-over systems serve multiple options through the Kalita Wave. Finally, if you’re in a hurry, there’s another option on bulk-brew. All the beans (and more) are available in retail bags, while if you’re hungry, there’s a selection of cake. Scottsdale, to the east of Phoenix, is a lovely area of shops, hotels, houses, quiet streets and, right in the centre, a cluster of four speciality coffee shops, forming a rough diamond. At the southern tip is Fourtillfour, the creation of Nico and Mia, who moved here from San Francisco. 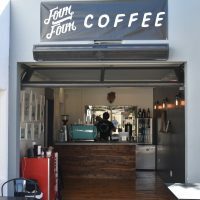 Fourtillfour satisfies their twin passions: great coffee and vintage cars, the couple often organising rallies and other events. I can’t speak to the cars, but when it comes to the coffee, it’s a small but lovely place. There’s an award-winning outdoor patio, which has the bulk of the seating, something you could only get away with in a climate such as Arizona, while inside there are a pair of small rooms. The first, accessible from the patio, has the counter, while the other houses a large Probat roaster, where Fourtillfour roasts all its own direct-trade coffee under the brand Four Coffee. This is served via a simple espresso-based menu, along with batch-brew, while if you’re hungry, you there’s a small breakfast menu and a selection of doughnuts. Naturally, the coffee is available to buy either in-store or on-line. It’s fair to say that I was blown away by the coffee scene in Montréal. I came to it armed with precisely zero foreknowledge and left deeply impressed with the range and quality of the coffee spots dotted around the city. Café Plume is another of the new crop of places which have bloomed in the last 18 months or so. It was recommended to me by Marie- Ève of the Pikolo Espresso Bar and her recommendation proved to be spot on. Café Plume is best described as a neighbour café. Located on the eastern edge of the plateau area of Montréal, opposite Parc Jeanne-Mance, it’s a laid-back, relaxed and friendly place with coffee that’s every bit as good as its setting. Throw in a generous provision of power outlets and free wifi and you have the sort of place that makes you want to move in next door (or, in the case of Café Plume, move into one of the flats above the shop). Or maybe just move into Plume itself! Enter your email address and receive notifications of new posts from Brian's Coffee Spot.